Yes! A resounding “Yes” for everything about this delicious mystery! 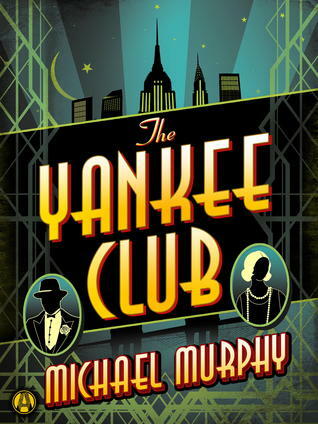 Michael Murphy’s The Yankee Club is a classic, hard-boiled, noir, detective/mystery novel, set during the Prohibition years. Jake Donovan is a cop-turned-detective-turned-mystery novelist. Murphy’s writing is crisp and strong and the reader senses that Donovan was a good cop and a good detective, but that his best days being active are behind him and that he’s settled in to the writer role very comfortably. Returning to New York from his home in Florida (where he moved to finish work on his novel without interruption) to meet with his editor, Donovan meets up with his old partner, Mickie. Mickie won’t tell Donovan what case he’s currently working on, but when Mickie is gunned down Donovan is on the case. But what Donovan doesn’t anticipate is that his former girlfriend, Laura Wilson, is also working on the case. Jake hasn’t gotten over Laura, and seeing her engaged to a truly obnoxious aristocrat (who orders Donovan to return to Florida and even buys the company that publishes his books in order to put pressure on Donovan) makes it difficult for him to work alongside her. Murphy really excels in building the story. What starts out as a nice, almost provincial story slowly escalates until the conflict has national and even world-wide consequences. You’ve seen me write it before…a story should have tremendous conflict to truly engage the reader. I was truly impressed at how this story built and how we became involved in something so grand, without our realizing it until it was upon us. Murphy’s characters are written so well that they seem to be real people, and not some stereotypical model. Jake isn’t superhuman – he’s a guy with a strong background in police/detective work who’s been out of the game a bit. His ex-girlfriend, Laura, is a Broadway actress who manages to be down-to-earth and kind and seems to understand how fortunate she is for all she has achieved (okay … so maybe this character is a little far-fetched!). But what puts the icing on this story are all the guest appearances of historical figures from a variety of backgrounds. Lillian Hellman, Dashiel Hammett, Franklin Roosevelt, Ethel Merman, and, in one of my favorite scenes, Cole Porter (coming up with the lyrics for “Anything Goes”). I get a sense that there may have been a book/story before this (or is it just strong writing to suggest the characters’ pasts?) and that there might be future stories. That would be great. But if not, this totally works as a one-shot mystery novel. If you are not traditionally a mystery fan, I think you will like this. If you are a fan of mysteries, you will love this book. Looking for a good book? The Yankee Club by Michael Murphy is a hard-boiled historical romp that is inspired genius, peppered with great characters. Thanks for reading and reviewing The Yankee Club. Had a great time creating the characters who return January 6, in All That Glitters.